Thirukkadigai is located near Arakonam in the Chennai - Bangalore route. There is a temple for the Moolavar at the top of a hill and a temple for the utsavar at the foot of the hill. There is an Anjaneyar temple on a smaller hill. 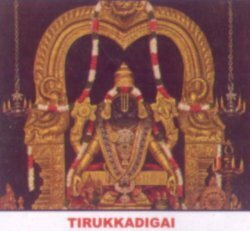 There is a belief that if you stay on this hill for just half an hour (1 kadigai), you will attain moksham & hence the Thirukkadigai. It is also believed that Vishwamitra maharishi worshipped the Lord here for 1 kadigai & attained the Brahmarishi status. There is a sannadhi for Varadaraja Perumal with Garudan on the banks of the tank on the way to the top. There is a popular belief that worhsip at this sthalam will rid devotees of diseases and mental disroders.